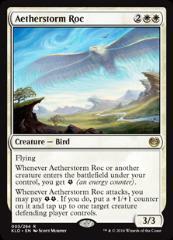 Whenever Aetherstorm Roc or another creature enters the battlefield under your control, you get Energy (an energy counter). Whenever Aetherstorm Roc attacks, you may pay EnergyEnergy. If you do, put a +1/+1 counter on it and tap up to one target creature defending player controls.